﻿ Hebrews 3:9 where your fathers tempted me by proving me, and saw my works forty years. where your fathers tempted me by proving me, and saw my works forty years. where your fathers challenged me, tested me, and saw my works forty years. Where your fathers tried me by proving me, And saw my works forty years. where your forefathers tried me and tested [my patience] when they saw what I did for forty years. where your fathers tried me, proved me, and saw my works forty years. When your fathers put me to the test, and saw my works for forty years. where your fathers put me to the test and saw my works for forty years. where your fathers provoked me to give proofs of my power forty years, tho' they saw my works. where your fathers tempted me, by proving me, and saw my works forty years. whom our fathers tempted in proving me, and saw my works forty years. Where your forefathers put my doings to the proof for forty years, Though they saw them all the time. Where your fathers tempted me, proved me, and saw my works forty years. 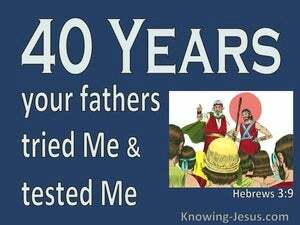 When your fathers tested me, proved me, and saw my works forty years. where your fathers tempted me, proved me, and saw my works forty years long. where your fathers put me to the proof, and for forty years felt what I could do. When your forefathers tried my forbearance And saw my deeds for forty years. 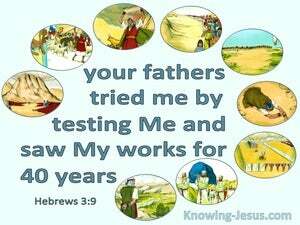 "There your fathers tested me and tried me, and they saw my works for forty years. where your fathers tested me and challenged me, and saw my works for forty years. where your fathers fully proved and saw my works forty years. When your fathers tested by proving, and saw my works forty years. when your fathers tempted me, proved me, and saw my works during forty years. Where your ancestors tried my forbearance, And saw my mighty deeds for forty years. where your forefathers so sorely tried My patience and saw all that I did during forty years. where your fathers tested me by proving me, and saw my works for forty years. where your fathers tempted Me by proving Me, and saw My works, forty years. This very man brought them out, working wonders and signs in the land of Egypt, and in the Red Sea, and in the wilderness forty years. But Elymas the magian (for so is his name interpreted) withstood them, seeking so turn away the proconsul from the faith.